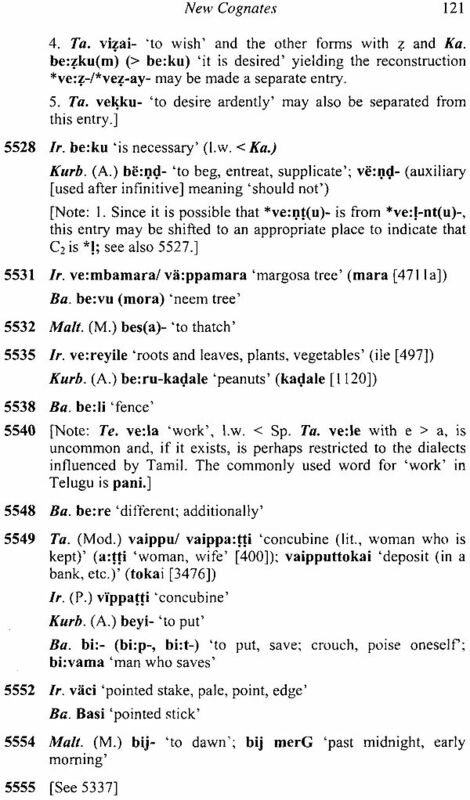 This work is the result of a modest attempt to provide a supplement by way of updating A Dravidian Etymological Dictionary (R) (2nd edition ) of Professors T. Burrow and M. B. Emeneau which is the only source for cognates in the Dravidian languages but is in need of revision. The present volume utilises the new data available after 1984 and offers suggestions for realignment of cognates and for additions and deletions in the individual groups. It is hoped that this volume with the new information in it will be of help to the users of the original work until a comprehensive revised version of the latter is brought out and that it will make the work of the scholar(s) who undertake such a revision easier. I take this opportunity to express my deep sense of gratitude to the Chairman of CICT and the honourable Chief Minister of Tamil Nadu, Dr. Kalaignar M. Karunanidhi, a renowned scholar of Tamil, for writing the foreword for this volume. I feel grateful to Professor S. Mohan, the Director of CICT, for his encouragement and offer to undertake the publication of this work. I thank Professor K. Ramasamy, Officer in Charge, Central Institute of Classical Tamil, Chennai for suggesting to me to work on this book under a project of Scheme for Classical Tamil and for taking all necessary steps for its publication. I am indebted to Professor P. R. Subramanian for a number of useful suggestions on some of the etymological groups. My thanks are also due to Dr. S. Prema who spared no effort in undertaking the laborious task of preparing the indexes. I thank Dr. M. Ramakrishnan for doing a nice job in readying the manuscript for publication and Mr. K. Sankar for making the layout for this book. Last but not least, I wish to thank my wife, Satyavati, for all encouragement and support in my academic pursuits. 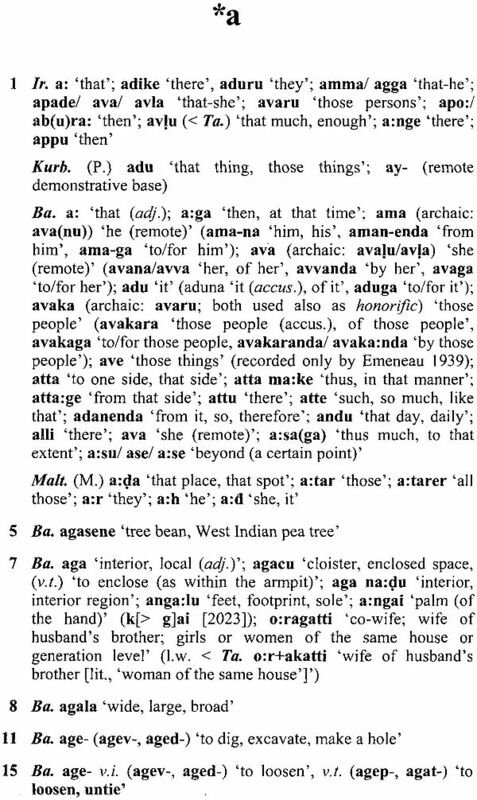 Burrow and Emeneau published A Dravidian Etymological Dictionary (2nd edition; abbreviated DEDR) in 1984 (the first edition of it appeared in 1961 and in between two supplements were issued in 1968 and 1972). From the time of the publication of the first edition, it has been serving as an indispensable reference work for Dravidianists as well as for other scholars interested in Indian linguistics. It contains 5569 groups of words of Dravidian origin and an Appendix of 61 groups consisting of items of Indo-Aryan or other non-Dravidian origin. The present volume is designed as a supplement to that work. The main features of it are outlined in the following paragraphs. While the original work (pp. 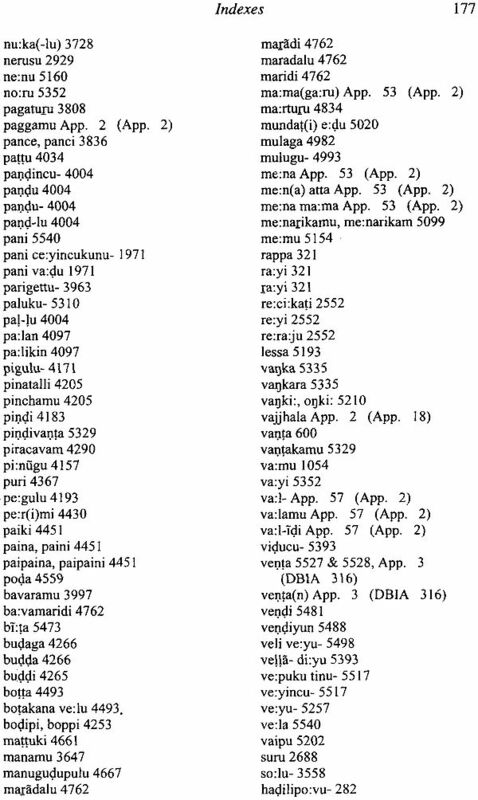 xii-xiii) contains a very sketchy table of phonetic correspondences for Proto-Dravidian sounds the present volume includes in it elaborate rules for the development of each proto sound in the daughter languages based on the present state of our knowledge (taken from Subrahmanyam 2008). 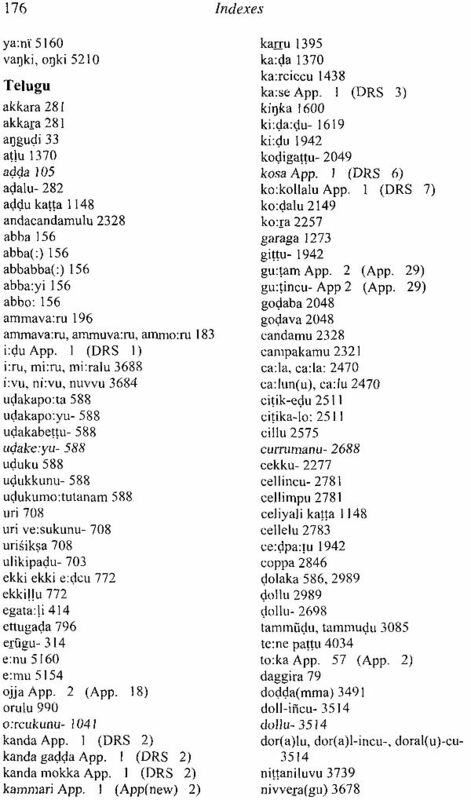 This volume contains as additions to the material in DEDR vocabulary items chiefly from the following five non-literary languages the sources for most of which appeared after 1984: Irula (taken from Zvelebil 1973, 1979 and Perialwar 1978a), Kurumba (taken from Kapp's works), Badaga (taken from Hockings and Pilot-Raichoor 1992), Manda (taken from Ramakrishna Reddy 2009b) and Malto (taken from Mahapatra 1987). Apart from this, some words from the literary languages (and also from the non-literary languages other than those mentioned above) that are left out in the original work either due to oversight or because of other reasons are included here. 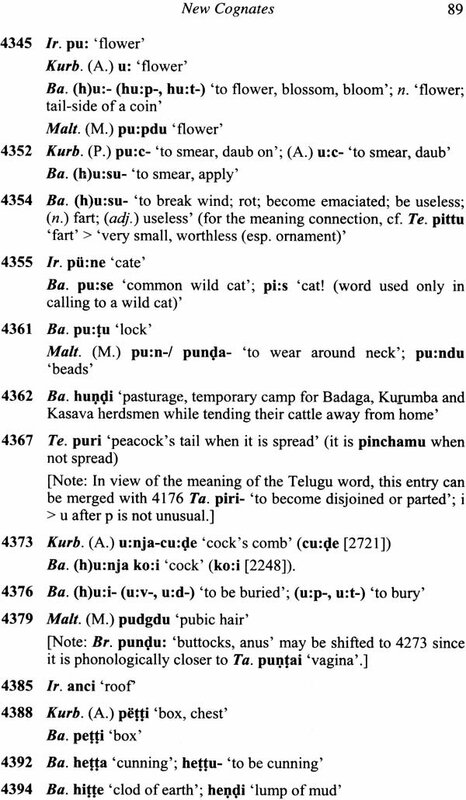 Many Modem Kannada words with the p- > h- change that are not found in the original work are added here. 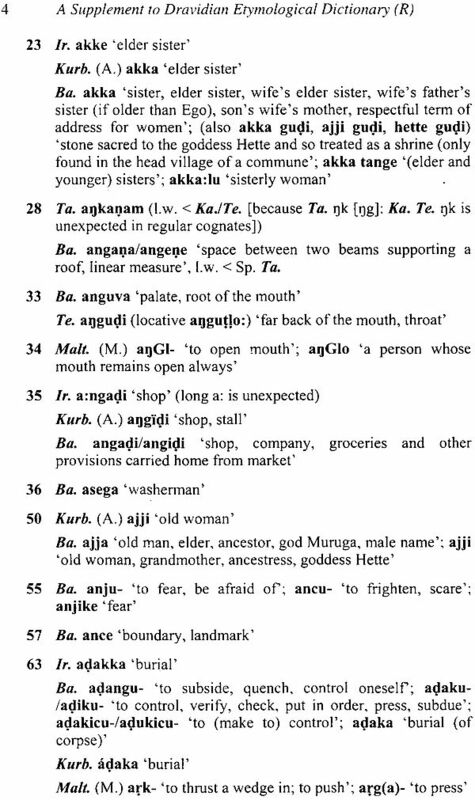 Two instances for significant addition of words from the non-literary languages that may be mentioned here are: (i) Ko. 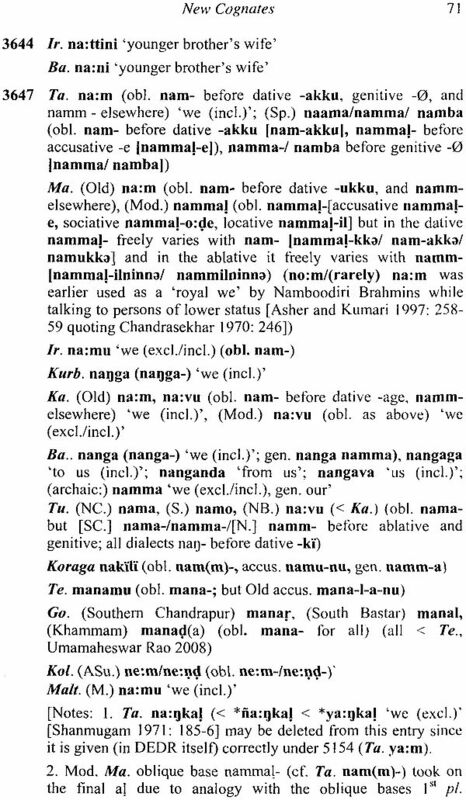 petg/ perk 'stomach, belly' (< pouay ) - one more example for the rule of backing of the root vowel in Kota formulated by Emeneau (1969; Subrahmanyam 2008: 179-80). (ii) To. sody 'quarrel', a borrowing from Ta. cantai (2318), taken from Toda texts; though the Toda word appears to be unrelated to the Tamil word at first sight the former is regular in showing the a > 0 and the other changes that have affected it. Words given from various languages in an entry here are of two types, those that are to be added to the entry in the original work and those already found in it but are here furnished with additional morphological, semantic and other information. The information added here includes such things as the plural form, oblique base, past and non-past stems and the word's status as a loan (where appropriate). Suggestions for the shifting of words of individual languages from one entry to the other as well as for shifting an entry to another location on the basis of the reconstructed root are also incorporated in this work. The authors of the original work themselves carried out intensive investigation in revising the groupings from the time of the publication of the first edition and received suggestions from other scholars with an open mind. This kind of rethinking is also a part of the work in producing such an etymological work with as much perfection as possible. Burrow and Emeneau continued and improved upon the work of earlier scholars like Caldwell, Kittel and Gundert in identifying Dravidian words that have entered Sanskrit and modern Indo-Aryan languages as loans (DEDR, pp. 759-68). I was able to add a few more to the list. 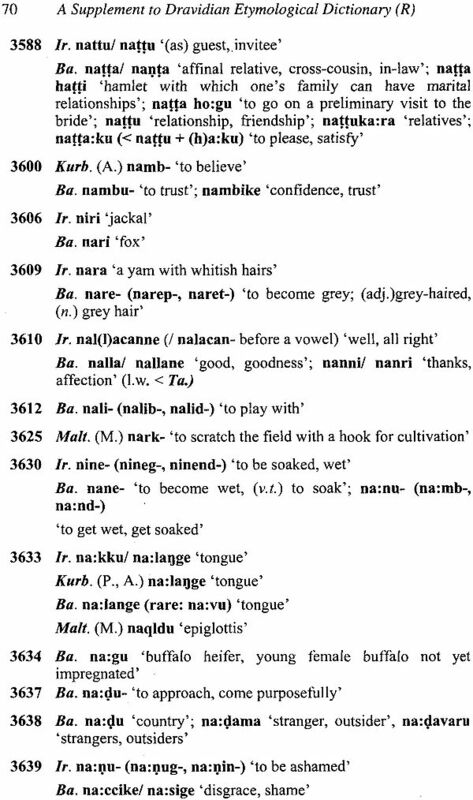 For example, the 'bamboo' words in 5485 (Ta. vetir, Te. veduru, etc.) are identified as the source for Skt. vetra- 'a kind of large reed'. On the other hand, the authors of the original work have identified a number of etyma originally thought to be Dravidian in the 1961 work as loans from Indo-Aryan in the subsequent works (DEDR, pp. 509-14). 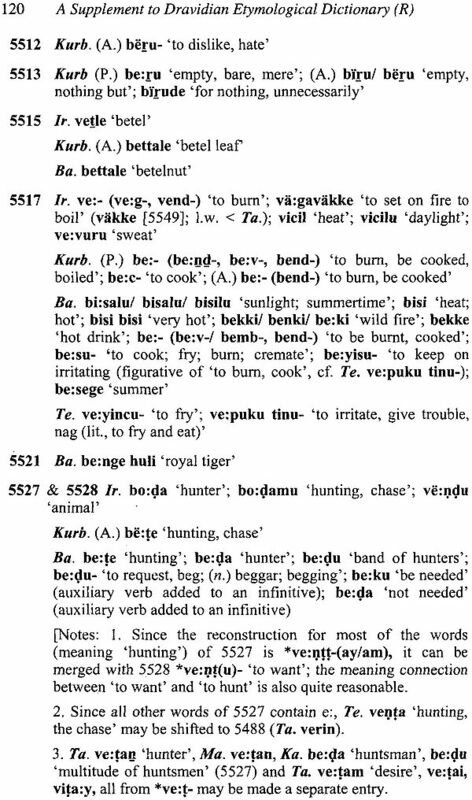 The present volume contains a few additions to the list of such groups; for example, the words of DEDR 4791 (Kol. ma:s 'man', etc.) can be considered as derived from Skt. manusya-Zmanuja- 'human being' rather than as those of genuine Dravidian origin. A table of the misprints noted in DEDR along with the corrections is also included.